I'm pretty sure I have mentioned in the past how much I love autumn. I get so excited when I start to see pumpkins and other squash in the grocery stores. I immediately start to brainstorm new recipes I can cook with them, and this is one those recipes I thought up. 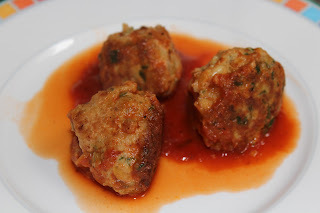 As you probably can tell from the multiple types of meatball recipes on my blog, my family loves meatballs, so here's another one. These meatballs are a tad sweeter than your average meatball, and are so yummy. They are fall wrapped up in one tiny bite! These meatballs are stuffed with butternut squash, spinach, and flax meal. Served alone, or with pasta, this is a delicious and healthy meal your whole family can enjoy starting at 10+ months. Put butternut squash and spinach in a food processor and pulse until finely chopped. 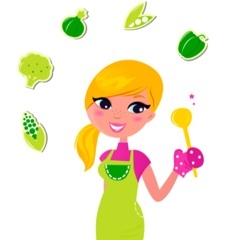 Mix turkey, breadcrumbs, parmesan cheese, flax meal, pine nuts, nutmeg, and sage in a large mixing bowl. Add butternut squash and spinach mixture to mixing bowl. Add beaten egg and salt and pepper. Mix together and then form into small balls. Heat 2 tbsp olive oil in a large deep skillet over medium high heat. Add meatballs and cook until golden brown on the outside flipping so all sides get cooked (approx 5 to 7 minutes). While meatballs are cooking heat the marinara sauce in a medium to large covered pot and let simmer. Add cooked meatballs to the sauce pot and let simmer for 5 to 10 more minutes. Let cool and serve alone or with your choice of pasta. Make sure to cut your little one's portion up into bite size pieces. Enjoy!